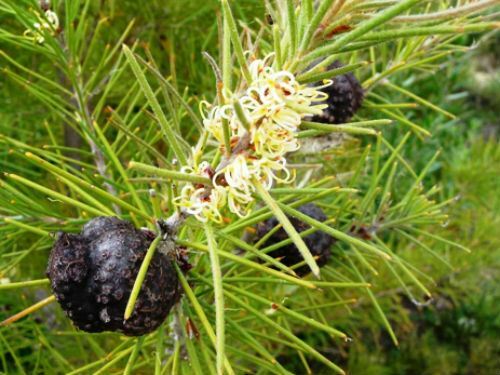 Hakea gibbosa is an erect, three metre tall shrub with a conifer-like growth habit. New growth is soft and hairy. Adult leaves are narrow, up to eight centimetres long and rather prickly. Flowers are creamy-yellow and grow in small clusters at the base of leaves. The flowering period extends from June to September. The blooms are followed by large woody fruits, up to four centimetres long and three centimetres wide crowned with two horns. Apparently the two horns, on many Hakea fruits, are the remains of nectar glands. Collecting fruits from plants is a rather painful experience. Hakea gibbosa is restricted to the Sydney region. Plants, with their large fruits, are prominent in Brisbane Waters National Park. One author describes the species as: “a grotesque prickly shrub”. We would not go that far in describing the species. It is certainly not a plant to grow near paths but is an eye-catching specimen when grown in native shrubberies. The dense, prickly foliage also provides safe nesting site for small native birds. Hakea gibbosa has become naturalized on Norfolk Island, in New Zealand and South Africa.